Truly an awesome concert. 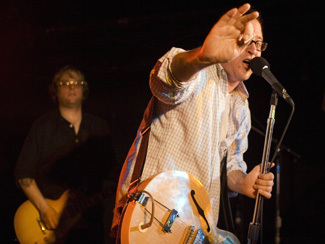 Craig Finn is easily one of the most dynamic frontmen I’ve ever seen. You don’t happen to have a setlist do you. There were some tunes I wasn’t familiar with. unfortunately no. Dude behind me totally broke etiquette and snagged Franz’s set list from right in front of me as soon as the main set was over, even though the encore songs were written on it. There were only two encore songs on the set list and I can’t remember what they were. I was standing beside the setlist snagger. I could not believe he did that. Totally brazen. I’m surprised you didn’t end up with a black eye, Frank. The person to your left was a little careless when it came to elbow placement. BTW, "Girls Like Status" is one of the bonus "Boys and Girls in America" tracks you can get through iTunes. I didn’t recognize the tune they played before "Killer Parties." "The person to your left was a little careless when it came to elbow placement." the other one might have been that. I made it to The Hold Steady show at the Horseshoe on Saturday night and it was fantastic. I finally get your "Robert Pollard meets the E-Street Band" description you gave of the band in your review of their show at Lee’s Palace earlier this year – he doesn’t so much sound like Mr. Pollard as exude the same sort of charisma onstage. I’m going tonight in Boston (Cambridge), and I can’t wait!! I’m starting to think that a roadtrip to Buffalo in December would be good. Despite the fact that the show’s on a school night. OK, I’m calling it. Although still great (I jumped around a lot and sweated over people a lot and I’m wondering if I’m the elbow guy), I actually felt this to be the show with least energy of the 3 they’ve played in town. And yes, it was still a high energy rock show, which translated to a lot of fun. But samey banter (def. less of it too, compared with the Lee’s show) and a feeling that, yes, these r ‘n’ r heroes were actually a little tired, left me just a tiny bit disappointed. Though how they do it, I don’t know. And, going massively against the grain here, I’m really not enamoured with the new record. I’m pretty sure the chronicling of all those Massive Nights will stop next time. I hope so, because I think that theme has become pretty tired. And I still love ’em. Actually I see where you’re coming from. I was definitely a bit disappointed there wasn’t more banter – that was the third time I heard the Saint Barbara story – and if you’re not feeling the record than I can understand that would translate to less enthusiasm to hearing it live. But while I don’t usually like the super-jostley shows, I totally enjoyed this one. Interesting that you thought the energy was lower, Dave. For me it was higher, but since I’ve only ever seen them once before with a "crowd" of 30 people, it’s not a fair comparison. I had such a good time at this show and I think a lot of it had to do with how up the crowd was, particularly for a Toronto event. It’s nice to know that we can have our socks rocked loose, if not off completely. The Boston show was good, although plagued by equipment failures, and suddenly thinking they were Guided by Voices rather than the Hold Steady. However, since a GBV live show was always a legendary experience, I had a good time. Frank, it’s an entirely reasonable conclusion to make. Sarah, as for the show’s energy, thankfully we had a rare showing of TO enthusiasm, so the crowd had it. It was the HS Crew, no doubt fatigued from Detroit et al, who were seeming tired. And thank goodness we cleared that up. "USA! USA!" did not escape from my lips mid encore. Or indeed at any point in the show.